The Vittoria Corsa G+ Isotech Foldable Clincher Tyre offers you the most cutting-edge tyre technology to hit the market in years. This comes in the form of its brilliant G+ Graphene construction. This ultra strong material offers 19% more rolling resistance than previous models whilst increasing puncture protection and lasting grip. An excellent product at a good price and faultless service. Tyres look great, roll fast and sound good too! I had made up a set of wheels with Swiss 240s hubs, Sapim X ray spokes and Pacenti Forza rims, I had these tyres on a pair of Zip wheels and was so pleased with them that I got another pair for these made up wheels. They work fantastic, comfortable and good grip and they look good a perfect match for my wheels. Pity there is now a new one out that can work tubeless! I have used many tyres now however my favourite are the Vittoria Corsa G+ they are a fantastic racing, or everyday tyre. I have found them to be quite durable even in wet conditions which is likely due to the Graphene compound . The grip and feel is amazing and you really push the limits with these. I love these tires! Used to be a die hard conti user, but what a difference. I can feel the jump in my Sprint with these, very fast and responsive tire. Closest to a tubular in a clincher you will get. I have been using Vittoria Corsa and these are my second pair of tires. They are light weight and not noisy on the road. It's a great value for money. I love these tires. Had them on my old bike and when my new bike trie got a puncture, I bought this again. The tan wall give the bike that slightly old school look...which I totally dig. Strong, light, and durable. This is already my favorite road tire. Very fast and just as durable as any of the other race tires. I also love the unique look. I'm very happy I stumbled upon Merlin Cycles website...definitely some of the best prices I've seen on these tires and everything else. I've put ~600 miles on my new tires so far. They provide smooth riding and great handling. Apparently they are fast also because I have been setting some new PR's on my frequent rides without really trying--especially on fast windy descents! 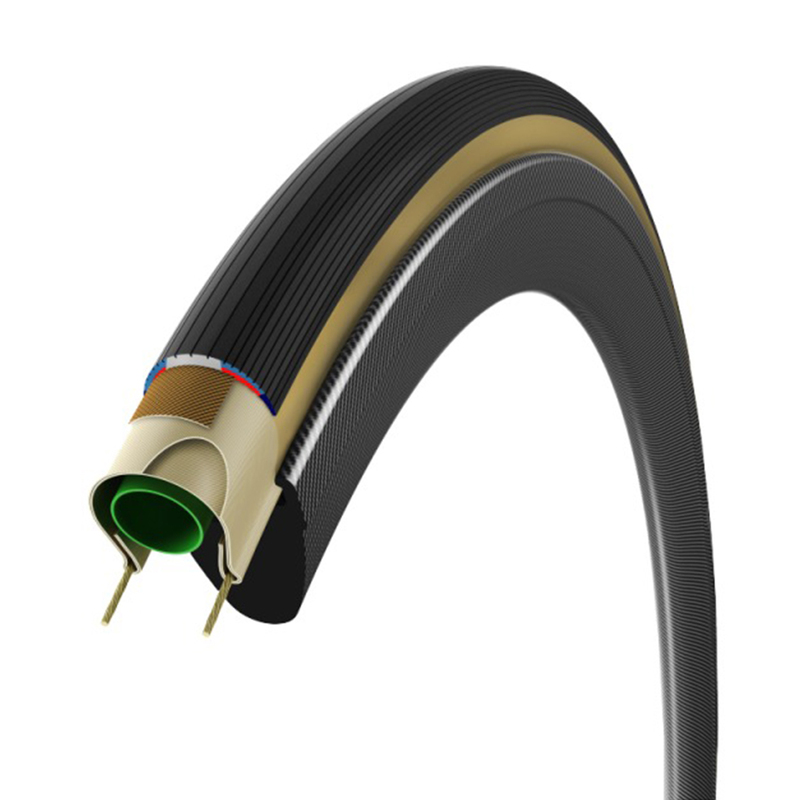 This tyre rides like a tubular when used with a latex inner tube, high speed decending is so sure footed. This is my second set the last pair lasting 6500 km and I am 78 kg I ride these with 95 psi front and 100 psi rear, as for punctures none very minor cuts to tread, lucky you say No just check your tyres before and after each ride. Quite straightforward to get on, didn't come across any issues, just the usual fiddly tyre change, and didn't need levers if you know what you're doing. The ride felt pretty different to my old ones, but in a good way. Firstly, I went for the 28mm after some research and took the plunge, so that will make a difference anyway. But the rolling resistance did seem very noticably faster, which was great. They felt like they were working with me, not against me. So far, no punctures, fingers crossed and I've done a few hundred Ks on them now. Would certainly recommend. These are now my all time favorite tires. They remind me of Vittoria silk tubular in ride quality, they're very fast, smooth riding tires. I now have 1000 miles on these that I've bought from Merlin, this is now my 2nd set of the Vittoria Corsa G+ tires. Merlins prices on these tires makes them all the better. Great tires! Super supple, super fast, they stay planted to the road when cornering, and to top it all off they look awesome too! No question, these are my favourite clincher tyres. Previously used the older version (without graphene) and loved them, and then had a foray into tubeless, which were great initially but then became problematic, so went back to clinchers. I'm so pleased I did, easy to fit, fast, comfortable, and great looking with tan sidewalls. I find that you have to pump them up to a little more than you would think, but it works without being bone shaking. I've got 25mm, and at 71kg run 110/115 psi. To assist, Vittoria have a free phone app that will tell you the "correct" pressure. Amazing tires! Wanted to get a classic color scheme and a tire that would perform well. This is it! The 'best' tyre in the world, and way better than Conti 2000s tyres. Rolls amazingly. Super comfortable. Outstanding grip all-round. Merlin's price and free delivery is the tops. Bought it as an extra since I love the way it looks on my Arabesque. Cool retro style that rolls like silk. These by far, have been the fastest and most durable pair that I have owned. I was a fanboy of the GP 4000 SII but these feel a bit faster. Also, they look incredible! Amazing tires. They feel so confident on descents, and I can barely even feel deformation, even though they are so compliant! Supple ride, good traction. Just started using them so I can't comment on flat resistance and durability. These are really supple tires and quite fast rolling. The comfort and speed from the 28mm version is worth the very slight increase in weight. I've used the 25mm tyres as well and they are pretty much the same but the extra volume of 28s are worth it if your frame can fit them.